Jersey City History - Old Bergen - Chapter XXI. Resolve that we think it our greatest happiness to live under the government of the illustrious House of Hanover, and that we will steadfastly and uniformly bear true and faithful allegiance to His Majesty George III under the enjoyments of our constitutional rights and privileges. At this meeting delegates to attend a general Congress were chosen. Considering the critical situation of the City and Province of New York, we do order and resolve that three Battalions of Militia be drafted out of the Militia of this Province, included in which are from Middlesex one hundred men, from Monmouth one hundred and forty men, from Essex two hundred and twenty men, from Bergen two hundred men, forming one of the Battalions. 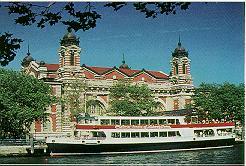 The whole to march to the City of New York with the greatest expedition. Congress divided the southern and middle colonies into two Departments; New York, New Jersey, Pennsylvania, Delaware, and Maryland were to comprise the Middle, and Lord Stirling was given temporary command. In March, 1776, Gen. Hugh Mercer, a close friend of Washington's, and a veteran of Fort Duquesne, joined the army, and was greeted by him with much warmth. The flying camp was just forming, and the Committee of Safety of Pennsylvania were forwarding some of their militia to the jerseys. Washington at once gave command of it to Gen. Mercer, and sent him to Paulus Hook, to receive and organize the troops as they came in. Lord Stirling, who was at this time in command of the American forces in New Jersey, recognizing the importance of holding this territory, ordered measures to be taken for placing Bergen in a state of defence. He counselled the building of forts at Paulus Hook, which would in a measure guard against attack from the Bay, and at the same time defend the approaches to the Hudson, and likewise ordered defences to be erected on Bergen Neck, to guard against any inroads from the southerly quarter. 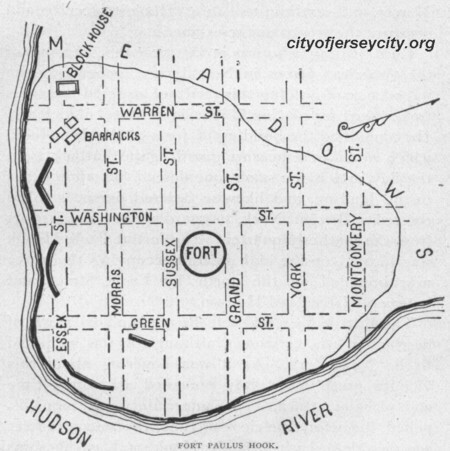 The fort at Paulus Hook was located on the high ground occupying the space now bounded on the north by Essex Street, and between Warren and Hudson. The enemy are already landed on Staten Island, and are leaving no arts unassayed, to gain the inhabitants to their side, and induce many to join them, either from motives of interest or fear, which I fear will be accomplished, unless there is a force to oppose them. We landed on this Island (Staten, author's note) to the great joy of a most loyal people, long suffering on that account, under the oppression of the rebels stationed among them. There	is great	reason	to expect a numerous body of the inhabitants, to join the Army, from the province of New York, and the Jerseys, and Connecticut. Shortly after landing on Staten Island, the British general stationed a small force, with two six pounders, on the extreme southeasterly point of Bergen Point, now called Constable Hook. The Americans, recognizing the danger of active operations being instituted by the British from this base, took precautionary measures to prevent their inroads. They strengthened the redoubt that was located on the high ground (near Forty-fifth Street and Avenue C) in Bayonne ; and July 4, 1776, Gen. Mercer was ordered to place there a garrison of five hundred soldiers, and likewise a strong guard at the ferries over the Hackensack and Passaic Rivers. Earthworks were erected on the heights of Bergen, east of Summit Ave nue and near the line of Academy Street. As the need was felt of better facilities for the transportation of supplies, troops, etc., a good road leading from Paulus Hook to Brown's Ferry was projected, and also one from Weehawlcen to the northerly crossing of the Hackensack. On the 12th of July, two vessels of the enemy's fleet, the Phoenix, forty guns, and the Rose, twenty guns, with their tenders, came up the Bay, and directed their course up the Hudson. The lookout on the Jersey shore, as well as that in New York, gave the alarm, and immediately all was activity. The batteries at Paulus Hook were freshly manned, and the priming of the already loaded guns was looked to; and as the vessels came within reach, they were greeted with a tremendous cannonading. They sustained but little damage, however, as they were amply protected with sand bags; and they passed on up, out of reach of shot, and anchored above Castle Point. The passing of these two vessels up the Hudson caused much anxiety, as it was feared that a landing of troops might be effected, which would not only harass and destroy the property bordering on the river, but might also cut off and capture the American troops stationed along Bergen Neck and Paulus Hook.